Ask any succulent gardener what their favorite type of pot is, and you may be surprised by their answers. Some succulent lovers are die-hard terracotta fans, while others plant their precious Pachyphytum only in plastic. It’s an age-old argument and like any good debate, there are advantages and disadvantages to both sides and it’s up to you to decide what’s best. The biggest differences between terracotta pots and plastic pots are in their appearance, durability, insulation, and water absorption. 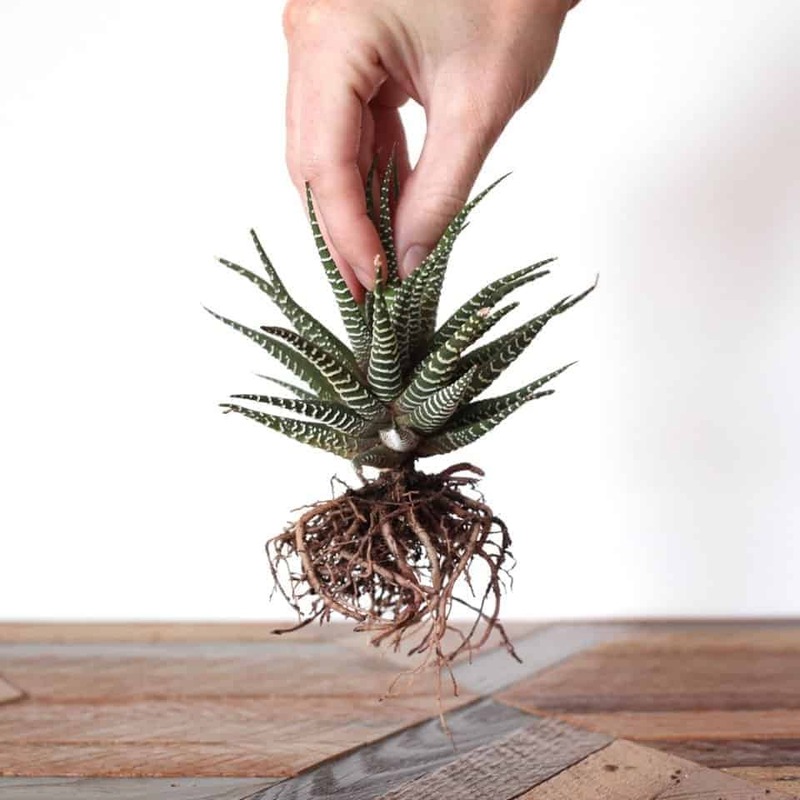 Depending on your climate, where you keep your succulents, and your personal preference, you may find that one material will suit your situation better than the other. Both types of pot are relatively inexpensive, so your budget won’t be a determining factor. No matter which type of pot you decide on, make sure you choose the right size and soil, and your succulents will be flourishing in no time. The most obvious different between terracotta and plastic pots is their appearance. Plastic pots are available in a nearly endless variety of colors. You can even find plastic pots that are the same color as terracotta. Terracotta pots can be found in many shapes and sizes, but unfortunately, the color range is quite limited. The most popular type of clay used for terracotta pots has a high iron content which causes the red coloring that terracotta is known for. However, other clays may also be used so you may be able to find terracotta pots in varying shades of brown. Terracotta is a porous material so depending on the mineral content of your water, you may notice salt deposits building on the exterior of the pot. Some gardeners don’t mind the white residue on their pots, while others find it unattractive. Since plastic is not a porous material, if you don’t like idea of salt building up on your containers, you may want to go with plastic pots. If you like the classic color of terracotta, but prefer plastic try these pots from Mountain Crest Gardens! The biggest downside to terracotta pots are how easily they can break. If they are handled too roughly, dropped, or blown over by the wind they can shatter. Luckily, terracotta pots are quite heavy and resistant to being knocked over. As long as terracotta pots are not mishandled they can remain strong and intact after many years of use. Plastic pots, on the other hand, can generally handle more abuse than terracotta. They are strong but flexible and will probably not be damaged if dropped or knocked over. Over time, however, prolonged exposure to the sun can cause the plastic to become brittle. Depending on where you keep your succulents, if you use plastic pots you may need to replace them after a few years of use. Depending on your climate and where you keep your succulent garden, insulation may be an important factor in which type of pot you should choose. If you live in a mild climate or keep your succulents indoors, insulation may have less of an effect on your plants, but it can still affect your garden to some degree. Terracotta pots tend to be much thicker than plastic pots. The thickness of the walls of the pot along with the ceramic material has an insulating effect on the soil. This means if your plants are exposed to extreme temperatures, such as a night of frost, they are likely going to experience less damage than those in plastic pots. In direct sunlight, terracotta will keep the soil at a slightly lower temperature, reducing the chances of your plant being damaged by extreme heat. Plastic does not insulate well and does not tend to stand up to extreme temperatures well either. 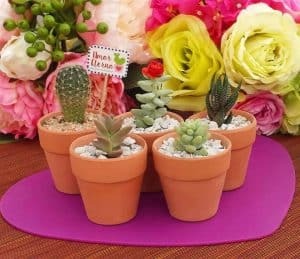 Succulents planted in plastic pots and exposed to extreme temperatures are more likely to suffer the ill effects of the cold or heat than those planted in terracotta pots. Caution should be used when using black or dark-colored pots, as they can absorb a significant amount of heat from the sun and may dry the soil too quickly and damage the plant. If insulation is not a concern in your climate, plastic may work well for you. If you’re on Team Terracotta, the Succulent Source has you covered! If you are an expert in watering succulents, you’ll be successful in keeping your plants alive no matter what material the pots are made of. If you’re new to succulent care or tend to be a little heavy-handed with the watering can, you may find terracotta pots to be more forgiving. The porous nature of terracotta allows excess water to be absorbed from the soil. This can be quite helpful if you have a habit of overwatering your succulents. However, terracotta’s absorption can also work against you, particularly during warm weather. The absorbent nature of the clay may dry the soil out too quickly, resulting in parched plants. This isn’t much of a concern during cooler weather but during summer you may need to water your plants more frequently to be sure that the pot isn’t stealing too much of your plant’s moisture. If you have a habit of forgetting to water your succulents, plastic pots may be your best option. Plastic is not an absorbent or breathable material, so the soil will take longer to dry out than with terracotta pots. Just make sure your plastic pots have appropriate drainage or you may find that your succulent’s roots have rotted due to excess moisture. 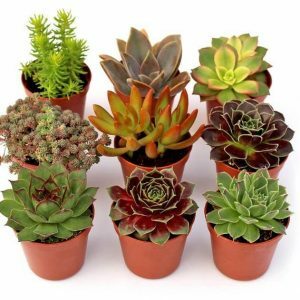 As previously mentioned, black or dark-colored plastic pots can also have a drying effect on your succulent’s soil. The dark colors absorb more heat from the sun, which will cause the water in the soil to evaporate more quickly. This can quickly damage a plant in extreme heat, so keep an eye on those succulents during the summer months. 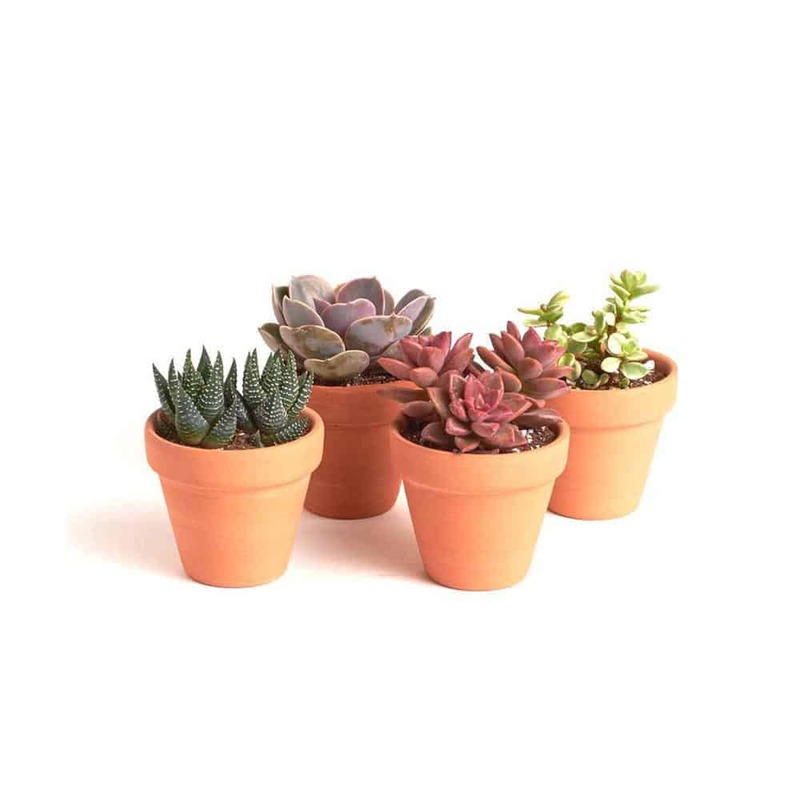 So, are plastic pots better for succulents or are terracotta pots the only way to go? Unfortunately, there is no right answer. The perfect pot simply doesn’t exist (although we prefer terracotta). What works well for one gardener may not work for another, so it’s important to consider the different features of each material and the effect they’ll have on your succulents. Once you choose a side, you’ll be ready to debate any gardener who disagrees! Tarah Schwartz is a freelance writer living in Scottsdale, Arizona. Her life in the desert has inspired a passion for succulents and cacti. DON’T Make a Succulent Terrarium. Here’s Why. I love my terracotta pot – but do NOT like the salt buildup on the outside of the pot. Would it be possible for me to spray paint the outside of the pot without effecting the integrity of the pot (or the plant)? (of course I would remove the plant for painting) I do not want to use plastic. Thanks for an extremely informative article! If you wanted to spray paint and then *seal* it, yeah, the salt would stop showing up. I expect it would somewhat compromise the moisture-wicking properties of terracotta, but that’s not the end of the world.